The first time we built the sales guy who was signing us up kept mentioning prestart meeting. I had no idea what this was and was not as prepared as I should have been. Second time around I was so organised complete with lists and sample cards. 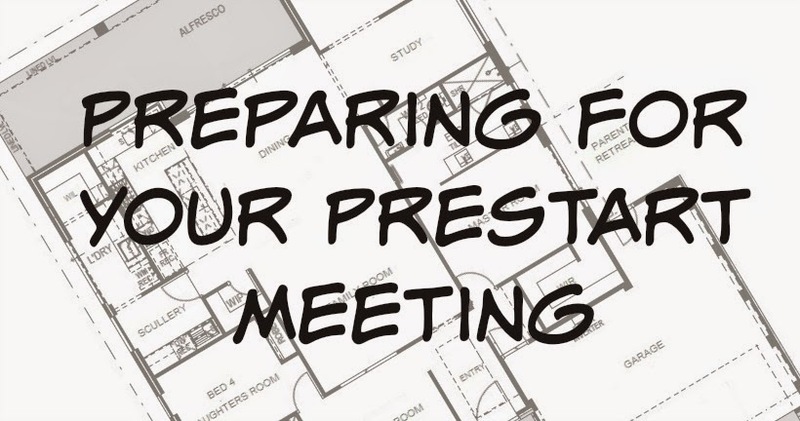 A prestart meeting is where you get to choose all your colours, cabinetry changes, any upgrades like different sinks, fancy tapware, door handles and all those finer details. Before you have prestart you usually have a tile meeting or head to a tile shop on your suppliers list and pick out all your tiles and cabinetry colour. Some builders may do this a little different. With most big builders you need to have done all your structural changes like moving walls, changing window sizes and ceiling heights when you sign up. These cannot usually be done at prestart so make sure you do these from the beginning. We did ours before signing officially with the builder as we wanted/needed to know the cost. Think of how your would put your furniture and see if it would work. If not you may want to change a full length window to a half window or move a doorway to another spot. As soon as we signed up to build the second time i pretty much went into the tile shops to see which place I was going to make my selection. There's a builders range to choose from... outside the builders range you get charged a fortune so I tried to stick within in. In a dream world I would have had large rectangle floor tiles etc but I'll save that for future when our bathrooms are old and dated and need renovating. I changed my mind a few times before prestart so I'm glad I started early as I would have been sad if I was stuck with my first selection. Do not leave your tile selection until last minute! To choose paint colours for exterior and all cabinet colours i went to masters and got paint card samples (sooooo many of them, all greys). I ordered laminex samples from their website. I also order some essastone samples too. This way I could play around with all my samples on my desk and see what colours would work well together and rule out colours instantly. Once I had decided I carried them around with me incase I needed to select something like flooring and glass splashback and had them as easy reference. Next is all about lists. Write or type.. whatever method your prefer each room of your house. Underneath write down every change and upgrade you'd like to make to that room - they of colours, cabinetry, electrical, fixtures. Get everything on your list costed... even if you think it will be too expensive. It's easier to delete things from your list after its costed. You may even get a nice surprise with some items. Personally I set a price in my head for each upgrades/change. If it was too above that it got deleted. Be prepared to be surprised/shocked in both good and bad ways at costings. Set the price in your mind.